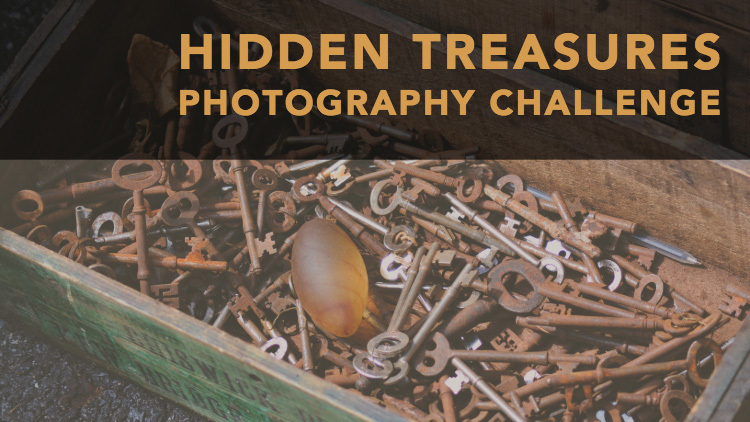 Well, folks, we haven't had a photography challenge in a while so it's time! And you don't even need a model for this one because I'm going to send you out to do a creative self-portrait. As photographers, we tend to like to stay behind the camera. But you need to come out and get in front for this one. You can learn a lot by doing self-portraits, and I'm not talking about quick cell phone “selfies” here. Those are fun and have their place, but not for this challenge. 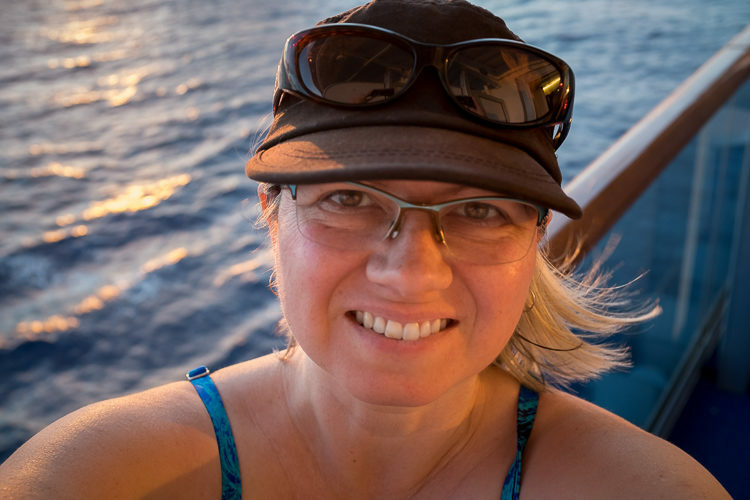 Self-portrait of me that I took on a recent cruise we took. I just thought the light was pretty on the water. The hard part isn't taking the photo – you can use a tripod and self-timer or a remote trigger for that or get someone to push the button for you. No, the hard part is being in front of the camera. But push yourself a little on this one. Get creative and incorporate something in your portrait that tells us about you. 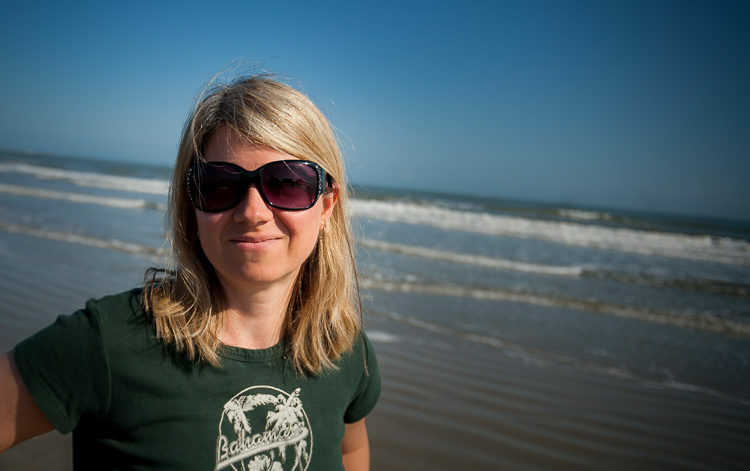 Photograph yourself doing something you enjoy like biking or walking your dog. Shoot your reflection in something shiny. Stick out your feet in a unique location and photograph them. Find your shadow and photograph it. I set up these shots and got someone else to push the button. Left: me at Machu Picchu in Peru. 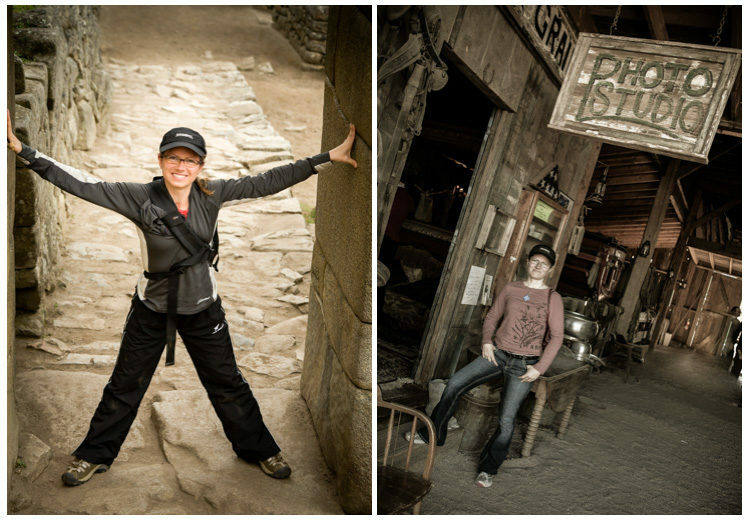 Right: me at a ghost town in Arizona. 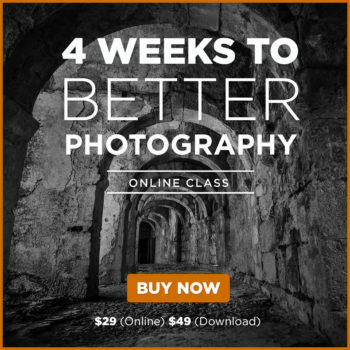 Like any portrait, you want to make sure you have good lighting (light that is flattering and appropriate), a nice background, good composition, and a good expression. As I mentioned above, there are a few ways you can get into the photo yourself. If someone else pushes the button is it still a self-portrait? I'd say yes if you set it all up, arranged the lighting, background and decided where you were going to stand and be positioned in the frame. Here are a few images of me, taken by others. I arranged the shot and then just hopped into the scene. When I do this, I often end up with really badly composed or out of focus images of myself. So if I'm not using a tripod, I do a shot of just the scene and show the person taking the photo so they get the idea. I also choose all the camera settings and set the focus point to “multi” or “zone” so the camera will find me and hopefully get me in focus even if the person pressing the button doesn't know how to do so. 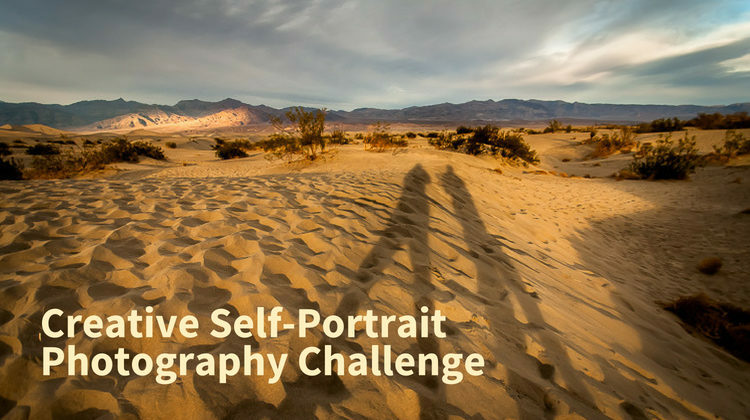 Do your self-portrait at a unique location. This is overlooking Machu Picchu in Peru, taken from Hyuana Picchu. Or keep the background simple and focus on your smile. 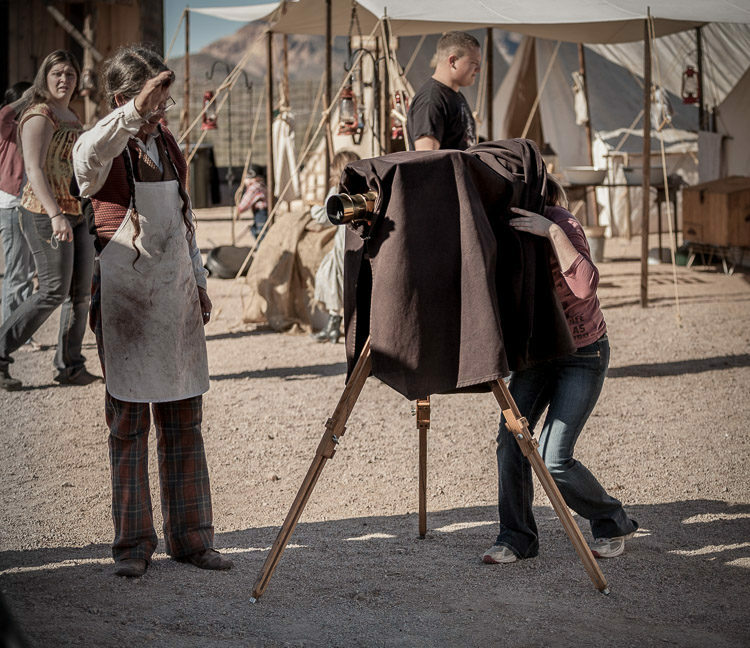 Me under the hood of an antique 8×10 view camera at a ghost town museum in Arizona. 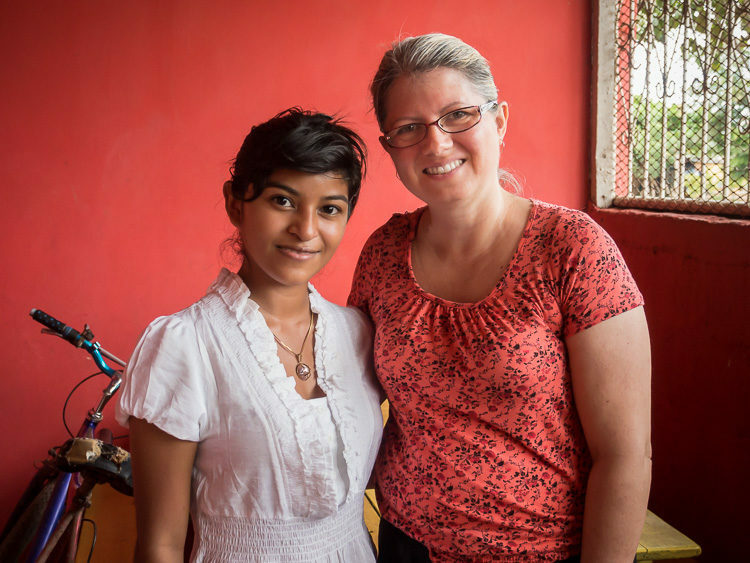 Me and one of the kids we sponsor in Nicaragua, Guadalupe. I chose the background and set up the shot. This is a great way to do a self-portrait if nobody else is around to press the button for you. You can use the self-timer on the camera but that can be a bit inconvenient running back and forth. If you have a wireless trigger for your camera, use that! 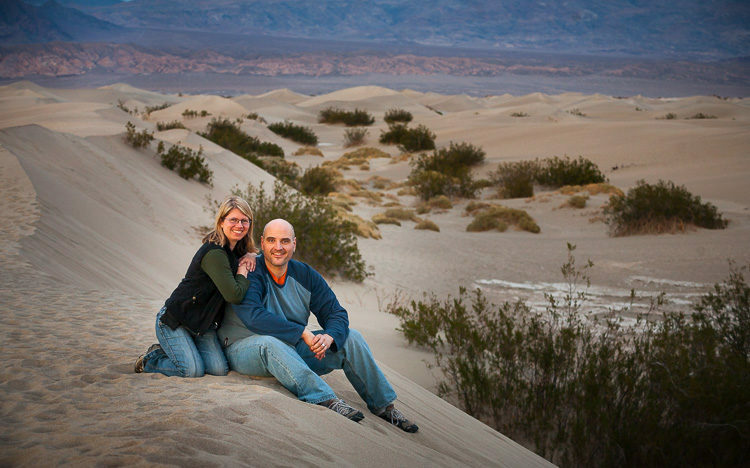 Me and my husband in Death Valley. I composed the shot with him in place and then used the camera's self-timer set to 10-seconds so I had time to run into the scene. I did that about four times and got some exercise too! 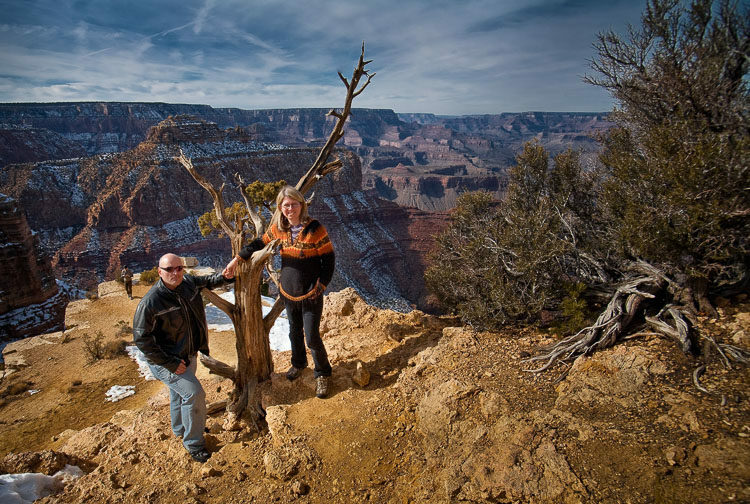 Another tripod self-portrait, this time at the Grand Canyon. 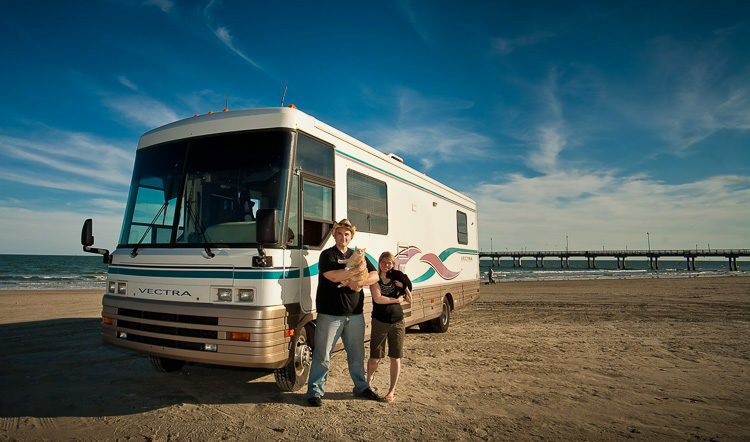 Us with our cats (Pumpkin and Boo, that we lost in 2012) on an RV trip in 2010. Remember I said to great creative with this? Using your own shadow and just photographing it can make for a unique and interesting self-portrait. 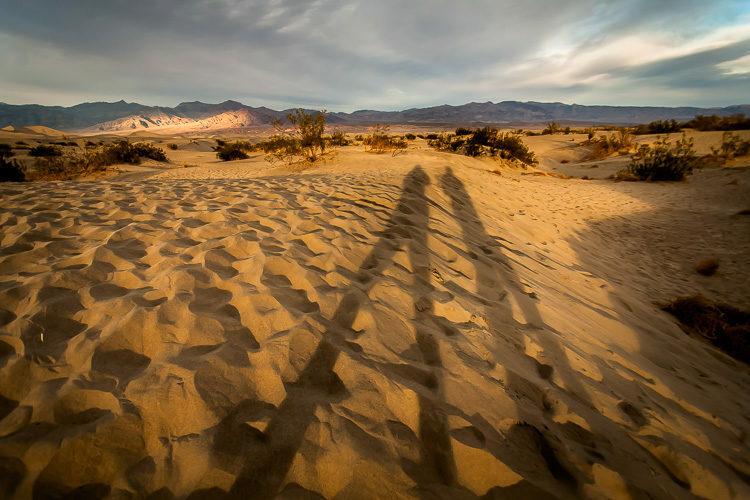 Sunset in Death Valley and our shadows. I just like it because I look so tall! Reflections work great as well for self-portraits. Sometimes I catch my reflection in a car mirror, store window, or even someone's sunglasses and use the opportunity to take a shot. 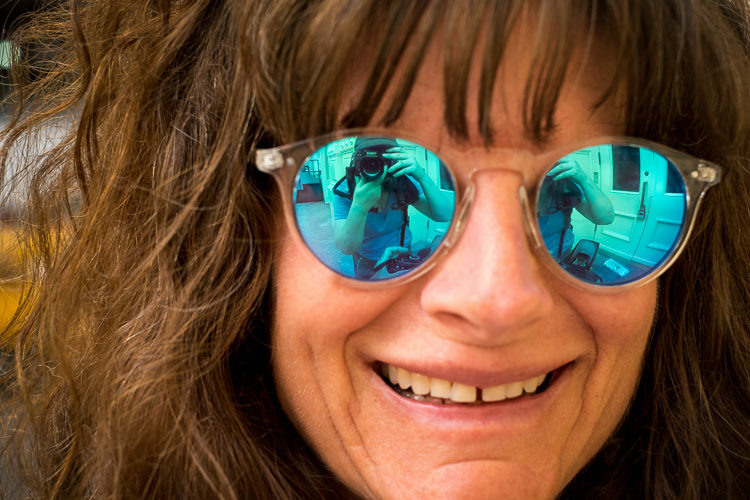 I just loved the reflections on her glasses. 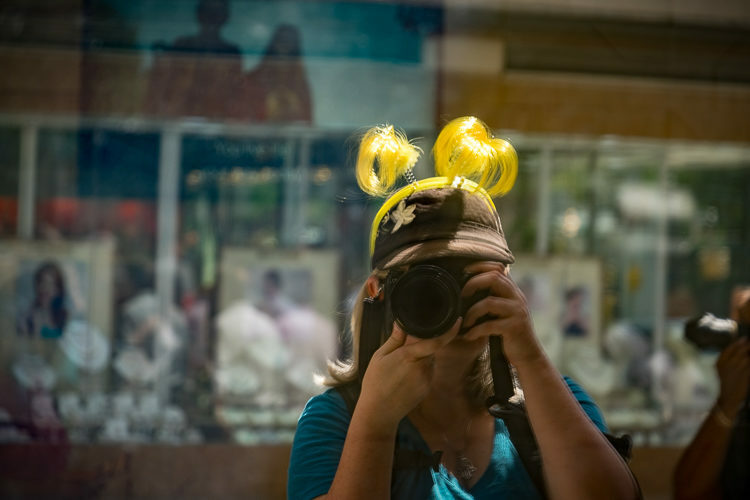 I wear these funny yellow things when I lead photo walks so people can see me. 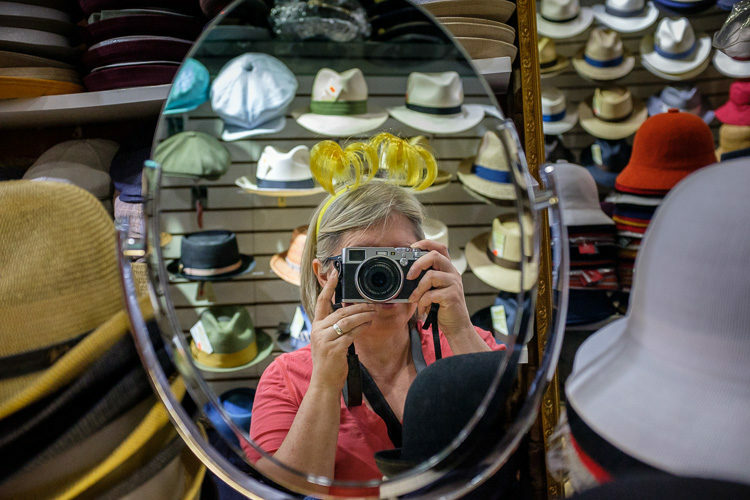 I caught my reflection in this mirror inside a hat shot in NYC and thought this was a funny shot. Different year, same city, same yellow antennae. Even if you don't have a tripod, and don't want your face to be on camera you can still do this challenge. I already mentioned the shadow idea, but along the same lines, it's okay to photograph your feet. Just make sure they are doing something interesting like walking in the surf on the beach, kicking back in a hammock, looking over the edge or a balcony or cliff, etc. 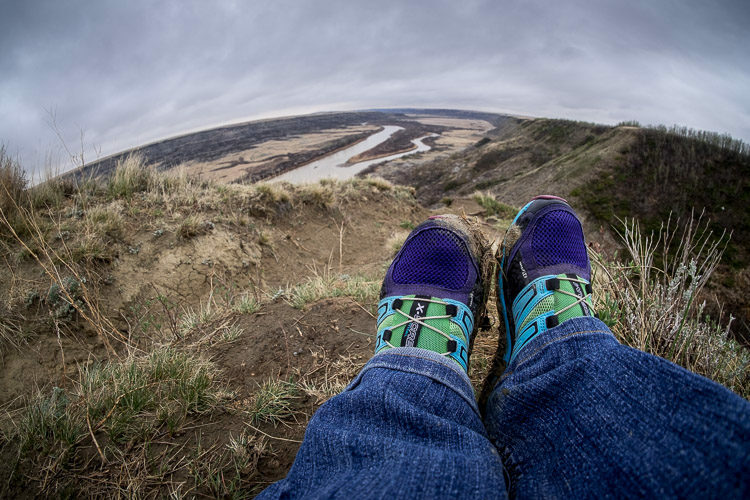 My feet and colorful shoes overlooking the Drumheller valley, taken during one of my workshops! 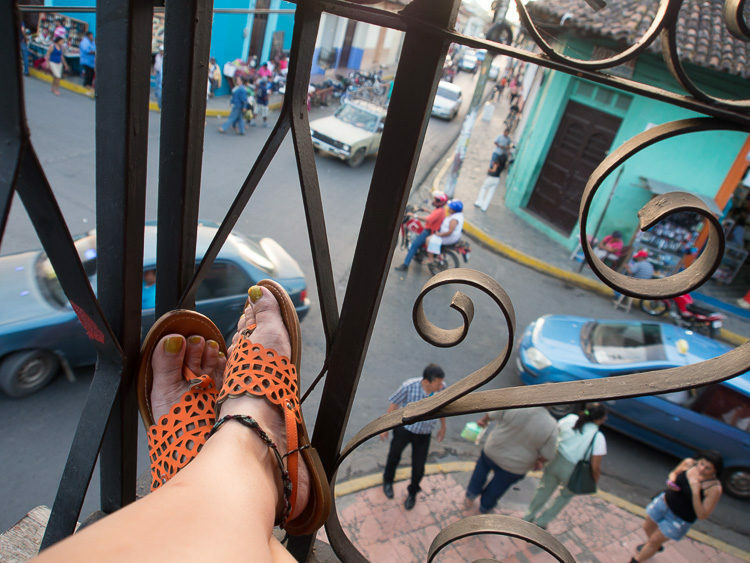 My feet chilling on a balcony overlooking a busy street in Granada, Nicaragua. My vantage point happens to also be a pub so I may have had a cold beer as well (for $1). When I think of selfies what comes to mind are the 100s and 1000s of selfies of people on Instagram, Twitter, Facebook, and other social media platforms. They aren't really creative, and most of them are done just to prove you were at a particular location or with a person or thing (selfie with a goat, for example). 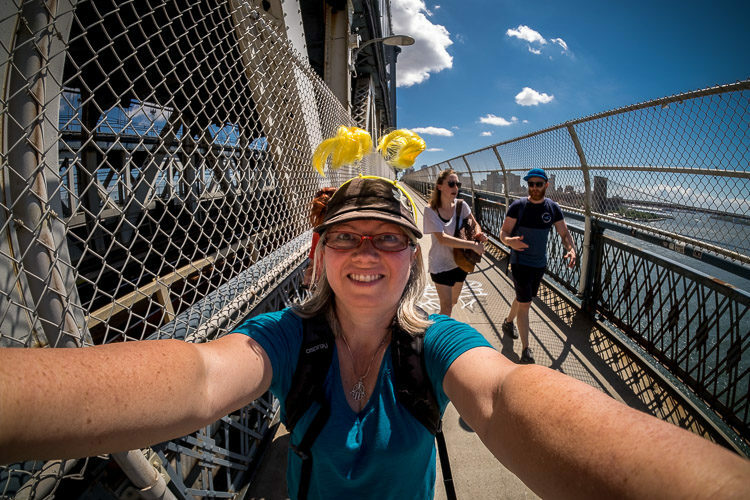 But if you use your regular DSLR or mirrorless camera you can take the art of the standard selfie up a notch. If you have a camera with a screen that rotates it makes the job even easier. Or you can do what I do. I have sort of developed a technique of shooting a selfie with the camera upside down. Shot with the camera upside down (with the strap wrapped tightly around my wrist so the camera didn't go overboard like my sunglasses did later). 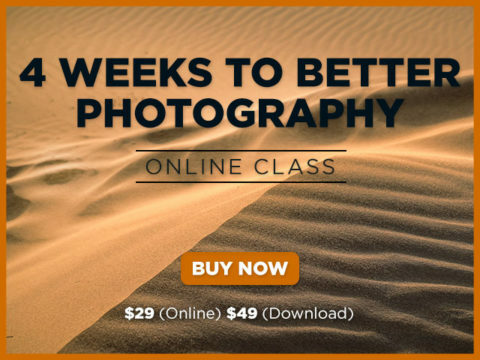 Hold the camera out at arm's length in front of you. Use a small lens, one that's wide enough to get you in the photo – HINT this will NOT work with your 70-300mm zoom lens! I find it's easier to press the button if it's on the bottom of the camera, so just hold it upside down, aim, and shoot. You may need to take a few shots to get the framing right, but with a little practice, you can master the upside down selfie (rotate the image right side up on the computer later). I shot this image with the camera upside down. Wow, do I ever have long arms! This was taken with the 23mm lens on my Fuji X100F (crop sensor). Okay, now I want to see your self-portraits. Remember to get creative and have fun with this. Tell us how you shot it (what lens and settings). Tell us about your experience doing this challenge? Did you find it hard to photograph yourself? Upload your photo, shooting info, and tell us what you learned by the cut-off date of August 31st, 2018. NOTE: please do NOT save your images as TIF (they will be too big to add in the comments, it must be under 2mb) and please do NOT email your images to me for critique. I cannot give personal critiques by email, leave your images below and I will comment there. Please note: if you do NOT fulfill all the steps above your entry will not be valid. Just adding the photo will NOT be counted as an entry. I want to hear about it too, please. 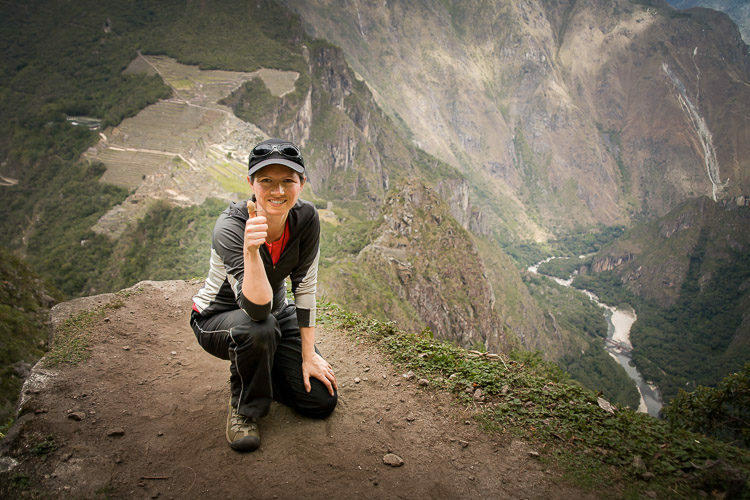 The point of these challenges is to help you learn something new – tell me about that. 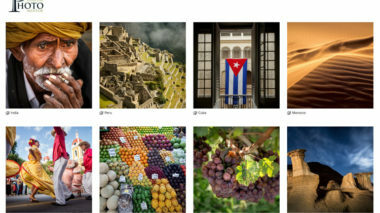 You may post more than one photo, and do this as many times as you like over the month (you can comment as many times as you like, and share as many photos as you want – but it will be counted as one entry per person). The more you practice the better you’ll get at it, like anything – so share away. I also encourage you to share the link to this challenge with a friend, so you can do it together!